All quilters know one thing for sure: a fabric stash is a living thing. It grows imperceptibly at first, but soon takes over your sewing room, and, if you’re not careful, your life. Joan Ford is a quilt designer who recognized a need to clear the clutter among her fellow quilters and came up with a fun and effective way to deal with it. Enter ScrapTherapy™, Ford’s feel-good method for organizing the mounds of fabric — from yards and fat quarters to skinny scraps — and turning them into quilts and a wide array of accessories. 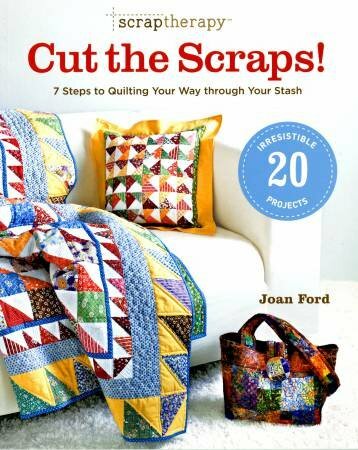 In this innovative book, Ford offers step-by-step instructions for cutting a fabric stash down to size — quite literally — and provides 20 original patterns for quilts, pillows, table runners, and more.